The mysterious land of Nepal is cut off from all other world by high snow-capped peaks and attracts travellers, scientists, esoterics and adventurers from olden times. This region is rich in Buddhist and Hindu temples, ancient monasteries where you can touch the spiritual values of the mankind. But despite all these facts, this mysterious kingdom became available for tourism only in the middle of the last century. The trek to the base camp of the world highest mountain – Mount Everest is the most famous and popular route. Every year it attracts a huge number of tourists from all over the world who wants to see all the grandeur of Everest. The program does not require special training, and any healthy person can take part in the trek to Everest base camp. Throughout the whole route tourists are surrounded by fantastic views of the Himalayas. In addition, they will have the opportunity to see one of the most beautiful peaks in the world Ama Dablam, one name of which makes climbers’ heart beat faster, as well as to meet the main ethnic group of Nepal – the Sherpas, with their culture and way of life. Sherpas’ culture demonstrates how different life and living conditions can be in different parts of the world. But the culmination of this trekking is to reach the top of Mount Kalapatar, which is an excellent vantage point of the mountain area Khumbu Himal, from where you can see Mount Everest. Trek to Everest base camp can be done simply by a linear route, which is used by up to 90% of trekkers, and you can go down the same way, but you can make a circle through Gokyo, discovering the new sceneries and not repeating the trail for a single day, but this route is made through the pass over 5000m high. The height of the pass does not affect the acclimatization schedule because some days before that you climb Kalapatar which is still a bit higher. Day 1. Arrive in Kathmandu. Expedition members arrive at the airport “Tribhuvan.” Another half an hour before the landing you can see the velvety green hilly Kathmandu valley out of the airplane window, which from the North is surrounded by Himalayan mountain ranges sparkling glaciers. The time difference between Moscow and Kathmandu is + 2 hours 45 minutes. The first thing you will often hear during your stay in Nepal is a traditional greeting “Namaste”, which literally means “In your person I salute God.” Nepalese visa can be obtained at the airport. The group meets the guide who will take them to the hotel and answer all the questions concerning the trek to Everest base camp. In the evening we all have dinner in national Nepalese cuisine restaurant. Day 2. Fly to Lukla (2800m) and trek to Phakding (2652 m). On the second day group departs from Kathmandu to Lukla by small plane. The flight takes about 45 minutes. Already from Lukla the trek to base camp begins. The route passes through the farms and villages of Sherpas along the trail and goes to Dudkoshi river and then down to Phakding. Along the way you will meet Tadokola river, from its banks you can admire the magnificent views of Kusum-Kangaroo. Then the group crosses the river by a suspension bridge and after a short ascent goes to the Ghat village. After another half hour of walking the group arrives to the Pakding village where stops for the night. Day 3. Trek from Phakding to Namche Bazaar (3400 m). The group starts the route in the morning. After crossing the suspension bridge over the river Dudkoshi we follow the road with little ascents and descents, and amazing views of the mountains Tamserku (6608 m) opens from the village Benkar. The road goes through several bridges and leads to Monjo, the settlement, where the main entrance to the Sagarmatha National Park is located. The Group enters the national park, and goes down to the suspension bridge over the river Bhotekoshi. Across the bridge Dzhorsal village begins. This is the last town before Namche Bazaar. The road leads through the bridge Imdzhatse River, from where winding trail goes up to Namche Bazaar. Amazing views of Everest, Lhotse and Kvangde peaks, as well as short-range view of the peak Tavache, are opening form this trail. Finally, the group reaches the village of Namche Bazaar, which is called the “village of colored houses.” It is the main gateway to the Khumbu region. Here the group stops for the night. Day 4. Rest day in Namche Bazaar (3400 m). Today the members of the group can visit the hotel “Everest”, where they can admire the panorama. They can also walk to the local shops and the market, which is particularly lively on Saturdays, or visit the Sherpa Museum. This is a great place to get acquainted with the Sherpa culture and mountaineering history. Day 5. Descent to the river, long ascent to the famous Tengboche High Monastery (4 hours, 3860 m). Night at the lodge. Day 6. Track to Pheriche (4250m). The trail passes through high hinged bridges, above the “boiling” through the huge white boulders streams. Day 7. Pheriche – Lobuche (4910m). The rise on the plateau, on which with a small climb we will approach the moraine of the Khumbu glacier. Day 8. Trekking from Lobuche to Gorak Shep (5190m), visit Everest Base Camp. From Lobuche the group makes a two-hour shift by the winding rocky path to Gorakshep, from where there are beautiful views of the mountains Kalapatar, Pumori, Nuptse and the valley Gorakshep. Then the group relaxes in a hotel, making a tea break, and then makes quite a long hike to Everest Base Camp and back. Hard day, but overfilled with emotions. Day 9. Ascent to the summit of Kalapatar mountain, trek. The ascent is quite difficult because of the thinner air. In the “hot” season this road is quite crowded. 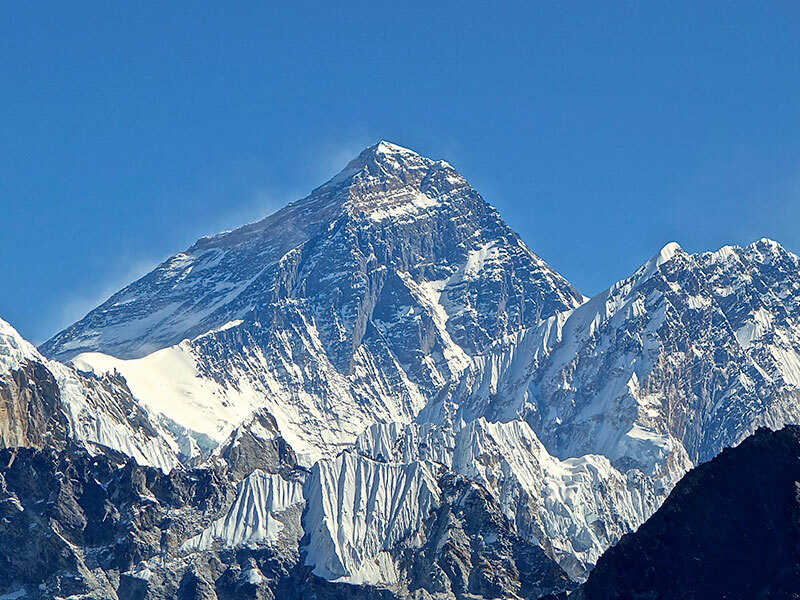 A large number of people come to Nepal only in order to see Everest and the Khumbu glacier. There are excellent views of Mount Pumori. Climb Kalapatar from Gorakshep takes from two to two and a half hours. The group then returnes back to the hotel in Lobuche to spend a night there. Day 10. Tengboche, overnight in huts. Day 11. Trekking to Namche Bazaar (3446m). The trek from Pangboche to Namche Bazaar is carried out by the same route which the group used during the ascent a few days ago. The hike takes about five to six hours. Day 12. Trekking from Namche Bazaar to Lukla. It takes from four to five hours. Descent is quite slow, so you can enjoy the beautiful green landscapes surrounding Sherpas’ village. In Lukla there will be a farewell dinner with all the team members. Day 13. Flight to Kathmandu. This day the group is given free time in the city, and then is accommodated in the hotel. 2 Nights on DBL 3*** Hotel accommodations with breakfast in Kathmandu. Domestic airfare (Kathmandu – Lukla – Kathmandu).